The Smithsonian's Freer Gallery of Art and Arthur M. Sackler Gallery have received a major gift to support Persian art and culture and related programs at the museums. The donor, Jahangir Amuzegar, has established two endowments: the Jahangir and Eleanor Amuzegar Persian Cultural Celebrations Fund, which will support an annual celebration in honor of Nowruz, the Persian New Year, and the Jahangir and Eleanor Amuzegar Fund for Contemporary Iranian Art. The gift is the largest ever for Persian programs in the history of the galleries and one of the largest gifts ever received by the Smithsonian's museums of Asian art. "My interest in establishing the endowments follows from the hope and trust that the Nowruz festivals should be celebrated for years to come and that the Galleries will have the ability to host contemporary Iranian art at the museum as far in the future as I can see," said Amuzegar. "We are deeply honored and grateful that Dr. Amuzegar has chosen to support Persian art at the Smithsonian" said Julian Raby, director of the Freer and Sackler Galleries. "His generous gift ensures that we will always be able to offer public programs featuring Persian culture in the nation's capital, and that we can focus on developing our contemporary Persian art collection, which complements our rich collections of the traditional arts of Iran." 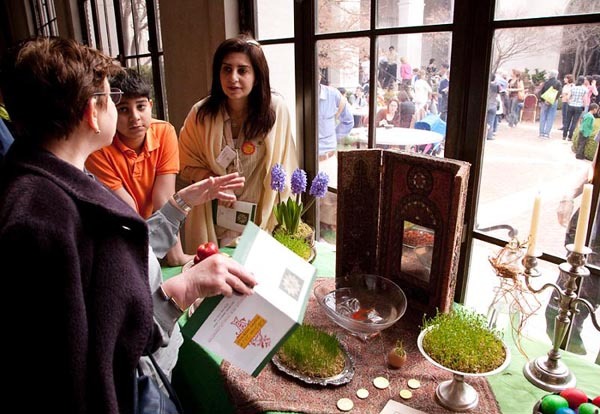 The Jahangir and Eleanor Amuzegar Persian Cultural Celebrations Fund will be used to provide ongoing support for the Freer and Sackler's popular annual Nowruz Family Days, which the galleries began hosting in 2009, with an annual attendance of approximately 7,000. The endowment will also fund a diverse range of educational and cultural programs open to the general public on Iran. The Jahangir and Eleanor Amuzegar Fund for Contemporary Iranian Art will allow for acquisitions as well as exhibitions, print and digital publications and a variety of public programs to engage young audiences. Amuzegar, an international economic consultant, served as the Government of Iran's Minister of Commerce (1962-3), Minister of Finance (1963) and Ambassador-at-Large (1963-1979). He has served on the Executive Board of the International Monetary Fund and written numerous books and articles on the intersection of Iran's economy, politics, and oil industry. Amuzegar earned his Ph.D. in economics from the University of California at Los Angeles and has taught economics at many American universities. The Freer Gallery of Art, located at 12th Street and Independence Avenue S.W., and the adjacent Arthur M. Sackler Gallery, located at 1050 Independence Avenue S.W., are on the National Mall in Washington, D.C. Hours are 10 a.m. to 5:30 p.m. every day except Dec. 25, and admission is free. The galleries are located near the Smithsonian Metrorail station on the Blue and Orange lines. For general Smithsonian information, the public may call (202) 633-1000 or TTY (202) 633-5285.